Fine collections of works of art, well-stocked libraries and the spectacular architectural environment all on your doorstep mean that studying History of Art at Cambridge is particularly rewarding. Our course covers a wide spectrum of art and architecture, from the medieval to modern and contemporary periods. The aim is to foster a wide and deep understanding of art and architecture, and to help you develop visual literacy and awareness, as well as a range of critical and analytical skills. There’s no substitute for looking at the real objects and we take full advantage of Cambridge’s outstanding resources, including the Fitzwilliam Museum and its picture conservation department, Kettle’s Yard and the Colleges’ art collections. The Department’s comprehensive library houses a rich collection of books, and you have access to the University Library and the Fitzwilliam Museum’s reference library (among others) as well. During vacations, students may wish to travel to see works of art and architecture, although this is not required. Any core departmental trips - for example, to museums and galleries - which form part of the course, are funded by the Department. We advise that you visit museums, exhibitions and buildings, such as churches or country houses, and take descriptive notes or sketches of what you see. Try to analyse the effect works of art or architecture have on you. Some familiarity with classical mythology and the Bible is invaluable for the study of the meaning of works of art. The admissions area of the Department website suggests other preparatory reading. Before Arrival: Computing: Most students buy a computer or laptop and perhaps also a printer before coming to Cambridge - Estimated costs: £600-900. If you have any queries about resources/materials, please contact the Department. 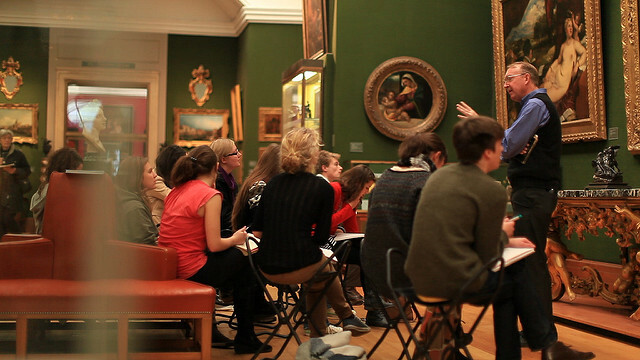 Students may join History of Art from other Cambridge courses after Part I in another subject. It's possible to study one or two years of History of Art, either before or after another subject such as Theology, Religion and Philosophy of Religion; English; Modern and Medieval Languages; Classics; or Philosophy. Occasionally students from other disciplines such as Medicine are able to join History of Art. To be able to change course, you need the agreement of your College that any change is in your educational interests, and you must have the necessary background in the subject to which you wish to change – in some cases you may be required to undertake some catch-up work or take up the new course from the start/an earlier year. If you think you may wish to change course, we encourage you to contact a College admissions office for advice. You should also consider if/how changing course may affect any financial support arrangements. Our graduates are well-equipped for employment in museums and art galleries, agencies for the care and conservation of monuments and heritage management, fine art dealing, publishing, advertising and the visual media, as well as for teaching. Our prominent graduates include the artists Antony Gormley and Marc Quinn; the model and actress Lily Cole; Dr Philip Rylands, former Director of the Peggy Guggenheim Museum in Venice; Sir Charles Saumarez Smith, former Director of the National Portrait and National Galleries, and former Chief Executive of the Royal Academy Sir Nicholas Serota, former Director of the Tate Gallery and now Chairman of the Arts Council; and the Hon James Stourton, former Chairman of Sotheby’s UK. Teaching is provided through lectures, seminars and supervisions. First-year students typically have up to six hours of departmental teaching each week, as well as a supervision linked to your weekly reading and essays. Particular attention is paid to the fi rst-hand study of works of art and architecture – lectures and classes are regularly held in museums, taught by curatorial staff and other visiting experts – and you receive exceptional attention and support throughout your degree. Assessment varies according to the paper being studied but typically includes written examinations and visual analysis tests (comparing and contrasting works of art), and a dissertation in both Year 1 and Year 3. Part I provides you with a broad introduction to the history of art, and to the making and meaning of art objects, with special emphasis on the architecture of Cambridge and the collections of the Fitzwilliam Museum. These run from the art of Ancient Egypt to modern times, and include major examples of medieval, Renaissance and post-Renaissance art as well as non-Western items. Part II deepens your knowledge and understanding by focusing in greater depth on specific issues. For further information about studying History of Art at the University of Cambridge see the Department of History of Art website. Please note that subjects such as Art and Design are accepted but Colleges normally require A*/7 in an essay-based subject. See History of Art: Subject Requirements and Typical Offer by College for College-specific requirements/preferences. All undergraduate admissions decisions are the responsibility of the Cambridge Colleges, so please check College websites for further details. All applicants for History of Art are required to take a written assessment at interview, if interviewed. Please note that your performance in the assessment at interview will not be considered in isolation, but will be taken into account alongside the other elements of your application. Department of History of Art - Explore History of Art in more detail on the department website. Preparatory Reading - Guidance on preparatory reading for applicants interested in History of Art. Why Study Art History - Why the History of Art matters. The History of Art Course - Information on the Art History course at Cambridge. Teaching and Learning - How the History of Art course is taught and assessed. What Our Students Say - Reflections from students on their experience of the course. Careers in Art History - Where studying the History of Art can lead. Alumni Profiles - Destinations of some recent Art History graduates. History of Art Outreach - A summary of outreach events in the History of Art. Kettle's Yard Learning Resources - Learning resources available from the University of Cambridge’s modern and contemporary art gallery, Kettle’s Yard. The ARTiculation Prize - Information on the art competition run by the Roche Court Educational Trust, which concludes each year with finals at Clare College, Cambridge.